Random question, and I'm sure it has a very simple answer, if not already asked and answered in some shape or form. How do you selectively delete entries from the autocomplete history dropdown thingy? For example, in the Run dialog box, typing a few letters will display a dropdown box with a history of matchine entries that you have previously run. I swear I used to be able to delete from the list by using the arrow keys to highlight and then press the DEL key. Regardless of whether this is true or not, is there any way to selectively delete entries from this list? Another example is the dropdown list in the Remote Desktop Connection dialog box. So, run 'regedit', navigate to the above branch, and select and delete the appropriate keys. The Search box history entries in Windows Explorer (and entries in the 'Recent docs' list in many other programs such as MS Office) can be selectively removed simply by highlighting them and hitting 'Delete'. Not the answer you're looking for? Browse other questions tagged windows-7 shell windows-explorer history autocomplete or ask your own question. How can I delete an entry from the Windows Explorer autocomplete/drop down list? 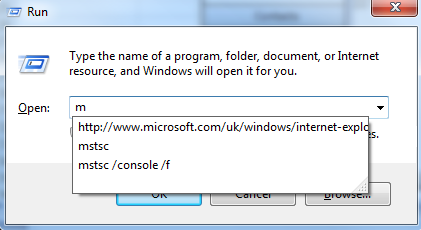 How do you add non-IE browsing to Windows 7's Run history? is there a way to disable Windows from switching window focus when I am typing? Selectively deleting a site from history fully on Opera/Chrome?